Prabu Tapa Agung had led a kingdom in West Java for a long time. He was getting old and therefore wanted to choose a successor. But unfortunately, he had no son. He thought of choosing one of his daughters, Purbararang and Purbasari. But it wasn’t an easy choice. They were both very pretty and smart. The only difference was their temperament. Purbararang was rude and dishonest, while Purbasari was kind and caring. With those considerations, Prabu Tapa Agung finally chose Purbasari to be his successor. Purbararang didn’t agree with her father’s decision. “It’s supposed to be me, Father. I’m the eldest daughter!” Purbararang said. Prabu Tapa Agung smiled. “Purbararang, to be a queen takes more than age. There are many other qualities that one must possess,” explained Prabu Tapa Agung wisely. “What does Purbasari have that I don’t?” Purbararang pouted. “You’ll find out when Purbasari has replaced me,” Prabu Tapa Agung answered. After a short discussion with his advisor, Prabu Tapa Agung ordered Purbasari to be moved to the woods. Purbasari was very sad, but she couldn’t do anything to defy her father’s order. She was accompanied to the woods by a messenger. He built a simple hut for Purbasari. After the messenger left, suddenly a black monkey came to Purbasari’s hut. He carried a bunch of bananas. From behind him, some animals looked on. “Are the bananas for me?’ Purbasari asked. The black monkey nodded, as if he understood what Purbasari said. Purbasari took the bananas with pleasure. She also said thanks. The other animals that were looking on also seemed to smile. “Are you willing to be my friend?” Purbasari asked them. All the animals nodded happily. Although she was living by herself in the woods, Purbasari never lacked of supplies. Everyday, there were always animals bringing her fruits and fish to eat. A long time had passed since Purbasari was banished to the woods, but her body still itched. At some places, her skin was even ulcerating. What am I supposed to do?” Purbasari sighed. The monkey who was sitting next to her stayed still, there were tears in his eyes. He hoped Purbasari would remain patient and strong. One night, on a full moon, the monkey took Purbasari to a valley. There is a pond with hot spring water. The monkey suddenly spoke, “The water of this pond will heal your skin,” he said. Purbasari was surprised, ”You can talk? Who are you?” she asked. “You’ll find out, in time,” the monkey said. Purbasari didn’t want to force the monkey. She then walked to the pond. She bathed there. After a few hours, Purbasari walked out of the pond. She was shocked to see her face reflected on the clear pond water. Her face was beautiful again, with smooth and clean skin. Purbasari observed her entire body. There were no traces of any skin ailments. “I’m cured! I’m cured!” Purbasari shouted in joy. She quickly offered thanks to the gods and also to the monkey. The news of Purbasari’s condition quickly spread to the kingdom, irritating Purbararang. She then accompanied by Indrajaya go to the woods to see Purbasari. Purbasari asked if she would be allowed to go home. 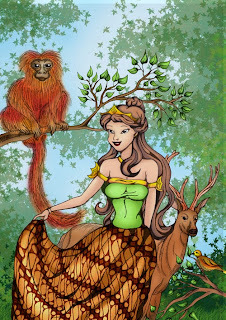 Purbararang said she would let Purbasari return to the palace if Purbasari’s hair were longer than hers. Purbararang then let her hair down. It was so long, it almost touched the ground. But it turned out that Purbasari’s hair was twice longer than Purbararang’s hair. “Fine, so your hair is longer than mine.” Purbararang admitted. “But there is one more condition you must fulfill, do you have a future husband who is handsomer than mine?” said Purbararang as she walked toward Indrajaya. Purbasari felt miserable. She didn’t have a future husband yet. So, without much thought, she pulled the black monkey beside her. Purbararang and Indrajaya burst out, but their laughter didn’t last long. The monkey meditates and suddenly transformed into a very handsome young man, a lot more handsome than Indrajaya. “I’m a prince from a kingdom far away. I was cursed to be a monkey because of a mistake I committed. I could regain my true form only if there’s a girl who would be willing to be my wife,” said the young man. Finally, Purbararang gave up. She accepted Purbasari as the queen, and also confessed everything she had done. “Please forgive me. Please don’t punish me,” Purbararang said, asking for forgiveness. Instead of being angry, Purbasari smiled. “I forgive you, sis,” she said. Soon after, Purbasari become queen. Beside her was the handsome prince, the former monkey known as Lutung Kasarung. Copyright © Cah Blora . All Rights Reserved. New Thesis SEO V2 Theme by CB Design.